The Metro Expo Line will begin running every six minutes for the majority of the day starting Monday, Oct. 24. Trains until now have run every 12 minutes; the service changes are expected to help reduce crowding and wait times for riders. Monday through Friday: Expo Line trains will run every 10 to 12 minutes from start of service until 6 a.m. After 6 a.m. trains will run every six minutes until 8 p.m., when they will run every 10 to 12 minutes. From 9 p.m. to close of service, trains will run every 20 minutes. On weekends: Expo Line trains will run every 12 minutes, then every 20 minutes after 9 p.m. Enhanced service may be in operation for special events, i.e. Rams or USC football games. Trains will initially be two cars each but will be lengthened to three cars as more of the new Kinkisharyo light rail vehicles arrive. Also, some Gold Line news: Metro will be adding train cars to the Gold Line as the agency receives new cars from Kinkisharyo, the contractor building the new light-rail vehicles. Currently, Metro is operating service every seven minutes during peak periods with mostly two-car trains and two three-car trains. More three-car trains will run as the new light rail vehicles become available. You can also see the schedule here. Regular fare is $1.75, which includes two hours of free transfers in one direction. Each person must TAP before boarding. If you need a TAP card, they can be purchased for $1 at TAP vending machines that are located at all Metro Rail stations. Need to park and ride? Check out the list of stations with available parking. Looking for things to do or places to eat along the Expo Line? Check out Anna’s earlier Source post. Follow Metro’s Twitter accounts @metrolosangeles or @metrolaalerts for service alerts and updates. For more routes and connections, use the Metro Trip Planner. Like the new Expo Line changes? Please leave a comment below! Media: official news release is here. This is very exciting. Hopefully it will make my morning commute a little more dependable. Steve, great work on the blog. But let’s look at the other side of the improved headways: Deteriorating service on main feeder bus lines. eg: the #92, serving Echo Park, Silver Lake, Atwater, Glendale and Burbank. Down to ONE HOUR HEADWAYS AFTER ~7:30 PM. Which is OK maybe at 2:00 am on a weeknight, but makes the system basically unusable during the workweek for many who work late or want to enjoy the evening. This becomes a self-fulfilling prophecy; if the line is unusable, no one uses it! Not to mention the political fallout: to reduce service just before the critical election with Measure M is simply lousy political strategy. “Why should I vote for more taxes when it doesn’t do me any good.” My sources in Metro indicate this was an intentional decision to protect the agency against possible failure of Measure M to pass. Bonehead thinking! I’m not a fan of the anti-rail crowd, but when the discrepancy between rail and essential bus service is that extreme, it feeds the opposition. Wise up Metro! Thanks for the kind words! Anna and I and the others who work on the blog really appreciate it! We certainly pass along comments on social media and the blog in a weekly report that goes to the folks upstairs. But I also encourage folks to get involved either by contacting the Metro Board or through the Service Council that covers their area, especially when it comes to service issues and headways and such. I have to say though that the way people were crushing into the short trains today reminded me of the videos of people being wedged into the trains in Tokyo. Even with more trains they were packed. I agree with you Craig I said it a while back that it seemed to me that they are purposely making the system look bad as a way to convince voters. Bad move Metro I’m no idiot I would have voted yes without the need of sabotage. Don’t alienate your own constituents it’s the rest of the county you have to convince. Expo trains are pretty packed on the weekend. Would benefit for added service of at least once every 9 minutes. I can’t believe they ever thought 12-minute headways (on any transit line) is okay. There were not enough rail cars available to run more frequent trains. It may not have been ideal, but I think it was better to get the line open for summer rather than let it sit there idle until all the new light rail vehicles arrived. Steve, does that also apply to the after-9 pm long 20 minute headways? Because that is way too long to wait for a train in a city, especially after a later night work shift or a night out at the bar, restaurant, event etc. 10 to 12 minutes might be more acceptable for late night, but as it stands now, many patrons will probably just opt for Lyft or Uber instead. I know that I probably won’t get a straight answer, but who should I ask regarding general costs of infrastructure upgrades like, say, grade separating the expo line? I understand the limit in funds to do such a thing, I just want to know for my benefit. Hard to say without knowing the extent of the separations. I can tell you that the first 3.9 mile section of the Purple Line Extension costs something like $2.8 billion. Expo is already above ground so really depends on how many bridges or tunnel sections you would want to build. Safe to say tens of millions of dollars for major upgrades. The first section was approved and funded before Measure R and they were trying to keep costs down — the original budget was in the 700 millions before some additional things were added to the project. Hope that helps. Good question. Thanks for the reply. Yeah, I was curious about the portion after Farmdalw station and the Flower street portion. Know I know how much great infrastructure costs. Awesome. Now on to more frequent weekend service and signal preemption! By this change, I assume that sufficient rail cars have now arrived. However. are there enough cars to operate three-car trains, or is Metro simply spreading the assets around? Now, what about the Gold Line? I assume that the present 7-minute frequency will remain, but are there enough cars available to operate three-car trains on all peak hour trips? Good question. It looks like they’re spreading cars (assets) around. I had assumed that the next move would be to provide enough extra cars on the Gold Line so that they could improve the peak frequency from 7 minutes to 6 minutes, but Steve’s message above implies that they’re trying to move to longer trains instead of more frequent service on the Gold Line (which seems like a mistake in priorities, IMHO). I’m guessing one more year before we see 3-car trains every 6 minutes on Expo. After Metro upgrades the Gold Line (which will take 3-6 months depending on their short-range plan for the Gold Line and the rail car delivery rate) they will need to deliver another 20-22 cars (i.e. another six months) to operate 3-car trains on Expo. This is really good news. I was born in Santa Monica and want to bring mom who last road the Red Car when she was 9 yrs old to Helms Bakery.. but I need to be sure the family can get a seat there and back on the weekend. Sorry to break it to your mom but weekends are largely unchanged. Getting that seat for here will remain as challenging as it was on previous weekends. Thank you Metro. It would be awesome if the info screens at 7th/metro display the updated departure times for relevant transfers often enough to accommodate the incoming expo passengers. And vice verse if transferring to the expo line! Keep on keepin on. What about the orange an red lines. Will the frequency of those lines be increasing too. Express lines are also needed for all these lines. Has there been any discuss of that? Varuna, I don’t think there will ever be serious discussion of an express line for our rail system. That would involve trains passing each other, which means more track, and even hollowing out the earth to make room. That’s a major infrastructure investment, and could very well cost as much as building rail lines to the rest of the system. All to save a few minutes while serving far fewer passengers. This is very good news. More frequent trains and buses is how you’ll get people on transit. Especially on weekends. 20 minutes after 9:00 pm. is pretty rough. Just think of when a game ends at Staples and that little platform at Pico being so packed. Not just the rail lines, but Metro needs to get their head out of the ‘9pm last call’ mindset for connecting buses. Several of the north-south routes like the 740 need to run much later and more often, especially after the Crenshaw-LAX line opens. Hooray, thank you! My average wait in the morning is 8 minutes at 7MC. It’ll be nice if it translates into better timing in the evenings getting back to the Red Line. Next, reopening the NoHo main parking lot. And if I’m really dreaming big, signal prioritization in DTLA for Expo and Blue lines. That may be a problem north of the junction, as now there will be on average a train in either direction every 90 seconds, or 40 trains per hour (ten [60/6] inbound and ten outbound per hour on each line). This is why Metro should, until the Regional Connector is fully operational, have all Blue and Expo trains use different platforms at Metro Center for all trips, thus eliminating the need for inbound trains to wait while an outbound train is changing ends and departing. Passengers transferring between the two lines would thus have to transfer at Pico. All the more reason for Metro to seriously consider under-grounding both the Expo and Blue lines from Metro Center to at least beyond the junction, where there should be a flying or borrowing junction similar to the Red-Purple Line junction, but ultimately to their respective right’s of way. Whoa, 14 hours of 6 min headways?? Umm, isn’t a 6 min frequency between 10am and 1pm a bit too much?? And this is coming from someone who loves empty trains. I’ve been on the Expo Line around 12p and sometimes 1pm and 3-car train sets every 12 min is plenty as it is. I would much prefer those resources go into the evening than potentially running half-full train sets at 11am. I know ridership will only continue to grow on the Expo Line but I just think 9-10 min off-peak with 3-cars would be better than 6 min and 2-cars. I agree, this is more midday service than they need, and I’m also one of the midday riders on Expo (occasionally). When Metro announced the service improvement, originally scheduled for December I figured they would maintain the midday service at 3-car trains every 12 minutes, which as you note is enough to serve the current demand. However, this would require them to switch their train sets two extra times every day, i.e. adding a car at 10 AM and dropping a car at 3 PM. Maybe they decided this would be too difficult and/or not worth the cost savings of operating the extra trains during the midday period. By the way, one 3-car train every 9 minutes provides the same capacity as two 2-car trains every 6 minutes. I.e. either way you get 6 cars every 18 minutes. No, it’s not too much. It should be 6 minutes all day and night. Buses, too. You can’t get people on transit when they have to spend an hour or more waiting on long trips with transfers. The headline says “Every 6 minutes” bit the body of the article says 10 to 12 minutes. Is this a mistake or am I not understanding somethong? 10-12 min before 6am, 6 min service from 6 to 8pm, 20 min service from 8p-Close (Mon-Fri Only). The article says 10 to 12 minutes “from start of service until 6 a.m.” Weekday service starts between 4:30 and 5 AM. I loved riding to and from work today on Expo with 6 minute headways! Waiting 5 minutes vs. 15 for the next train really made it feel like a real transit system. And I say 15 from before because with the old headways the gaps between trains always seemed to stretch out longer than 12 minutes. One nitpick — I use NextTrip to check when the next train is arriving all the time. It didn’t seem to be very accurate today. Both eastbound in the morning and westbound in the afternoon it indicated a “ghost train” and the arrival time went by without an actual train. Minor issue though as I wasn’t too disappointed when instead of 2 minutes waiting I only waited 5! Great job, Metro. Keep on improving and we will keep on riding. Now that four new LRT cars are arriving every month, when will three-car trains on both the Expo and Gold Lines become the norm? Just a wild guess, but we’re probably gonna have to wait until all 78 cars are delivered, but my hope is by December we will at least see a few 3-car sets during rush hour. Another comment. What specifically is being done to prevent bottlenecks at the junction and at Metro Center caused by running trains every 6 minutes on both the Blue and Expo Lines, or an average of one train every 90 seconds in both directions? Even when the Regional Connector is fully operational, which should relieve the load at the Metro Center, there will still be a potential bottleneck at the junction. Same case will exist at the Blue-Gold-Expo junction adjacent to the Little Tokyo Arts District Station on the Regional Connector. Is this a flying or borrowing junction with the two mainline tracks on different elevations? This is why serious consideration should be given to eventually under-ground the line between Metro Center and beyond the junction so the two lines will not interfere with each other at the junction as is the case now. Did Metro finally figure out that the average person needs to have a maximum 5 minute wait time to take public transit? Now they just need to have smaller buses or shuttles using 6 minutes headways on our roads. The dispatcher at 7th/Metro was switching trains between the Blue and Expo Lines this afternoon. I can understand the desire to maintain train spacing, but when they use a two-car train to serve the Blue Line, this practice cheats Blue Line riders of the seating capacity they need to serve their ridership demand. Ridership loads on the Blue Line are 50% higher than on the Expo Line, so the three-car trains should stay on the Blue Line. From what you are saying, Metro is apparently “Robbing Peter to Pay Paul.” I can’t imagine the train-masters juggling the consists between the Blue and Expo Lines. This would be ridiculous. Both lines absolutely require three-car trains, at least during the peak periods. Since both the Blue and Expo Lines appear close to being “maxed out,” maybe it is time to start thinking about the possibility of operating four-car trains, at least during the peak periods. This assumes, of course, that the cars are capable of operating in trains longer that three cars. I assume that this is possible because the LRT cars are all-electric. It should be possible to lengthen the platforms at Santa Monica, Metro Center, Union Station, Sierra Madre Villa, Atlantic. and APU/Citrus Collage to accommodate four car trains and, in the case of the Blue Line, the fourth car could be added or dropped off at Willow if street running of four-car trains is impractical in Long Beach. In the later years, the Pacific Electric routinely performed this operation at North Hollywood on the San Fernando Valley Line. The Pacific Electric frequently operated trains longer that three cars on several interurban lines such as to Long Beach and San Bernardino using their 1200-series cars, and to Glendale-Burbank when while still using their 550-class wooden cars, The only exceptions were trains of the Hollywood (600-700 series) and PCC cars which were limited to three cars because of slow air brake response. However, three-car trains of both classes were frequently operated on the Glendale-Burbank and Venice Short Lines and even during the closing days of the Monrovia-Glendora Line. Metro North and the Long Island Railroad currently run trains that are longer than some of the station platforms they stop at. In this case, there are frequent on-board PA announcements informing patrons which cars to move out of if they wish to debark at such stations. It is fascinating seeing signs with the number “12” in the “middle of nowhere,” so to speak, informing the train operator where to stop his/her 12-car train. In Metro’s case, the doors for the articulated units at either end of the train could be wired so as to not open at those stations with only three-car-length platforms. More on the line between Metro Center and the junction. There is another bottleneck, and that is the traffic signal at the mouth of the tunnel which periodically stops trains in both directions and even two trains traveling in the same direction. What, if anything, is being done to relive this situation? Again, a fully underground line in this area would be a great benefit to both the trains and automobile traffic. Traffic signal priority would of course help, but having trains stopping all traffic every 90 seconds would probably be a “show stopper” in the eyes of the LA DOT. Not plausible. They’ll need to upgrade blue line power delivery systems for that. Frank: while I’m a huge advocate of the Expo Line, I would never claim that the ridership demand warrants 3-car trains every six minutes. The existing ridership levels, ~45,000 on average weekdays, were served adequately by 3-car trains every 12 minutes during the peak periods. The current operating plan – 2-car trains every 6 minutes – will be sufficient to serve the ridership demand up to 60,000 daily riders, which should be reached in the next few years. The planned expansion to 3-car trains every 6 minutes will serve ridership demand up to 90,000 daily riders, which is more than is forecast in any long-range plans. By the time ridership demand approaches this level, 20-30 years from now, the Purple Line will extend far enough to siphon off some of the ridership demand in this corridor. I think the major issue with using the Expo line to commute is the time it takes going downtown. My trip this morning took 35 minutes from La Cinega to 7th St. but 15 minutes of that was the last 3 stops. It seems that the timing getting into the downtown station really needs to be worked out. I realize it’s a small station with a lot of trains arriving but it needs to be looked in to. A lot of that stretch involves traffic signals controlled by the city of Los Angeles. While Metro and the city do work together to coordinate the lights and trains, it’s ultimately up to the city to decide the degree of signal time for the trains. More the reason to under-ground the both Blue and Expo Lines from Metro Center to at least beyond the junction if not all the way to where each line enters its respective ROW. The signal at the mouth of the tunnel is especially bad as it stops trains on both lines. I guess Metro is getting the kinks out of this new timeline. In the meantime, the Blue Line is suffering. I watched three Expo trains leave the station (7th/Metro) on Monday evening before my Blue Line train finally showed up. And in the mornings, I am seeing more of the long, unexplained pauses at Grand/LATTC before we are allowed to come downtown. Great news about this service change! I’m glad to see Metro implementing it early. This is a moment to celebrate. 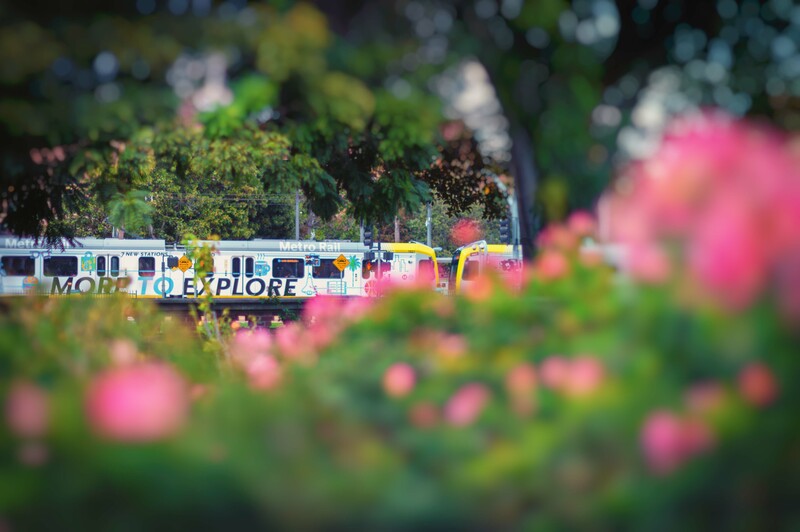 As we celebrate, it is important to note what many people have mentioned here and on this post — the approach to and operational constraints related to Expo operations have lowered quality of service and capacity on the Blue Line. It’s so great to see the Expo Line be a victim of its own success! This is a clear demonstration of how public transportation is more driven by politics than rational thought. Here is what I see and hear about the Expo lines. 1) packed trains. 2) slow trains. 3) significantly increased road delays on at-grade intersections (including bus service). I believe these are all good things as it will help bring in more transit dollars. It’s clear the expo and blue lines were poorly designed to operate at the service level needed to truely be an alternative to the automobile. The lack of regional connector is a major problem. The lack of grade separation is a significant issue. The lack of bus only lanes on perpendicular at-grade routes is huge. Will Metro have to start removing seats like most other systems around the world? The scary thing is that even lower income non-drivers are switching to Uber for short trips as their time is becoming increasingly more valuable. Got off an Expo train to DTSM last week, and another was pulling up for DTLA at Rancho Park Station. By the time I got to the end of the entrance, another was pulling up for DTSM. I was VERY impressed. Still no response to my suggestion that all outgoing Expo and Blue Lines use separate Metro Center platforms at all times until the Regional Connector is operational. This would eliminate incoming trains from either line having to wait while an outgoing train changes ends and departs. I have downloaded a YouTube video where an inbound Expo train had to wait several minutes for an outbound Blue train to change ends and depart before serving the same (west) platform previously served by the departing Blue Line train. The scissor crossover at the south end of the station should make this a routine procedure. I assume that the local operator knows which trains are assigned to each line. In the event that an inbound Expo or Blue train is designated to leave on the other line, then it should be routed to the platform nominally assigned to line that it will soon serve.